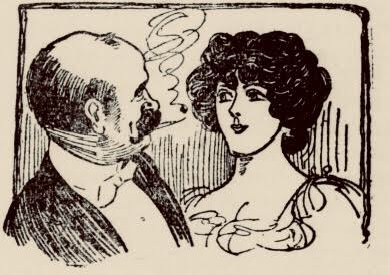 The gentleman never smokes, or spits upon the walk, to the exceeding annoyance of those who are always disgusted with tobacco in any shape. Never picks the teeth, nor scratches the head. Never swears or talks uproariously. Never picks the nose with the finger. Never smokes, or spits upon the walk, to the exceeding annoyance of those who are always disgusted with tobacco in any shape. Never stares at any one, man or woman, in a marked manner. Never scans a lady's dress impertinently, and makes no rude remarks about her. Never crowds before promenaders in a rough or hurried way. Never treads upon a lady's dress without begging pardon. Never loses temper, nor attracts attention by excited conversation. Never dresses in an odd or singular manner, so as to create remark.